Merry Ho Ho Freebies!! Recipe Cards + Vector Birdies! Merry Ho Ho everyone! I hope all of you who are celebrating have a fabulous Christmas and an awesome New Year!! Here’s some presents for ya!! 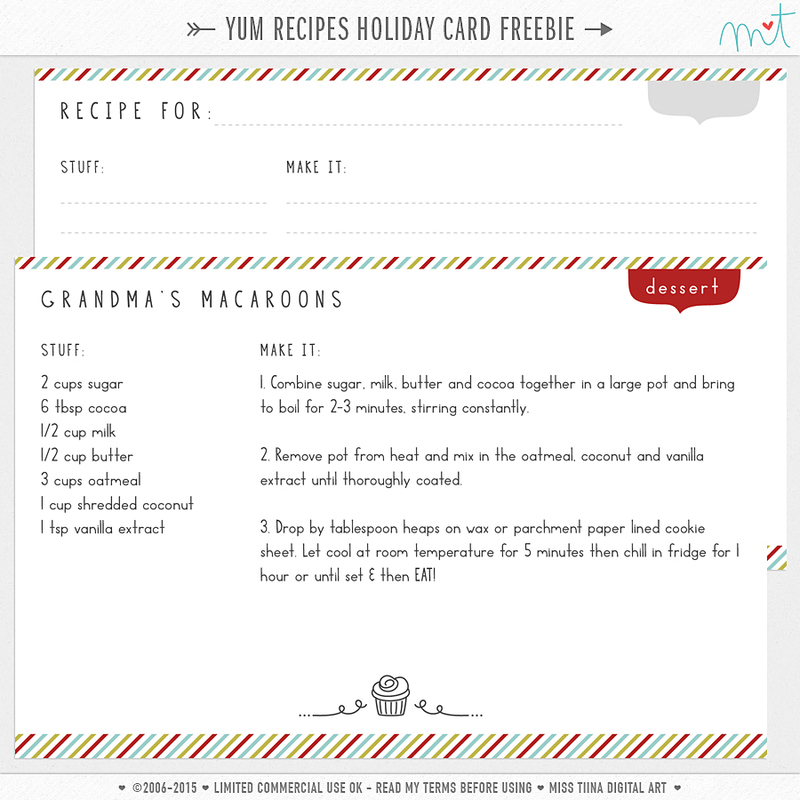 FREE recipe cards! 4×6 in size with editable text! 2 versions included… add text with your favorite program or print out the blank card and write on it yourself. Free recipe too!! My moms macaroons! Try them, they are super easy & SO YUM!!! 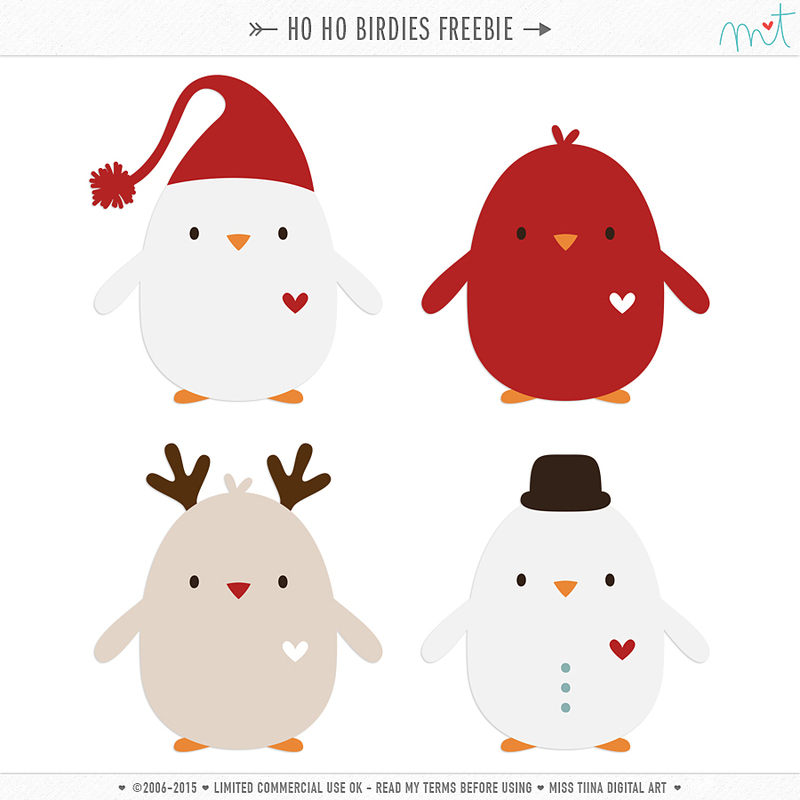 Vector Birdies – HoHo – cute layered birdies all ready for Christmas! so cute!!! Thank you and have an awesome holiday!! Merry Christmas to you and your family! Thank you for the gifts. They are fabulous as always! Thank you Miss Tiina! Merry Christmas to you and your family! Wow.Thanks for that great freebies Tina. Thank you Tina, for the wonderful gifts! Merry Christmas for you and yours! Such fun – thank you! Thank you, they are all great, but I think I love the birdies best. That little reindeer is to die for! Happy Holidays! Merry Christmas to you and your little family! Thanks for the freebies! Thank you for the awesome freebies! Merry Christmas! Merry Christmas and thanks so much for the downloads. thank you! love your new baby! These are awesome! Love the Birdies! Merry Christmas to your family! Thank you for the wonderful goodies. Your going to have to keep the girls away from your beautiful (handsome) boys… Happy Holidays. thank you! these birdies are sooo cute!!! thanks so much -love the recipe ‘stuff’ heading and the birds are too cute! Your boys are adorable! Thanks for the freebies and Merry Christmas! so cute! thank you an da very Merry Christmas! Thank you so much for this post. I want to let you know that I posted a link to your blog in CBH Digital Scrapbooking Freebies, under the Page 3 post on Dec. 25, 2011. Thanks again. Thank you SO much!!! Love it all! Thank you for these lovely presents! Happy Holidays to your and your family! Cute! Not sure if I can use vector but these were to cute to pass up. Thank you for the penguins. Thank you and your boys are so adorable! Thank you so much for all the wonderful gifts! Your freebies are always amazing :) Happy New Year to you and your family! Thank you for your gifts.Your birdies are extra cute! Valuable info. Lucky me I discovered your web site accidentally, and I’m shocked why this twist of fate didn’t happened earlier! I bookmarked it. Thanks for all three freebies ! Thanks so much! I hadn’t anticipated the freebie being still up! Thanks a bunch! love your cute shapes! Your little birdies are SO cute! Just wanted to let you know I’m sharing them on my blog tomorrow. Thank you so much for the freebie.